Ingredients: Made with fresh, raw Cocos nucifera (coconut) oil. Sealed for safety and freshness. Contains no parabens, SLS, petroleum, synthetic fragrances, or phthalates. Free of artificial colours, preservatives, or sweeteners; no dairy, starch, sugar, wheat, gluten, yeast, soy, corn, egg, fish, shellfish, animal products, salt, tree nuts, or GMOs. Suitable for vegetarians/vegans. Canadian brand. 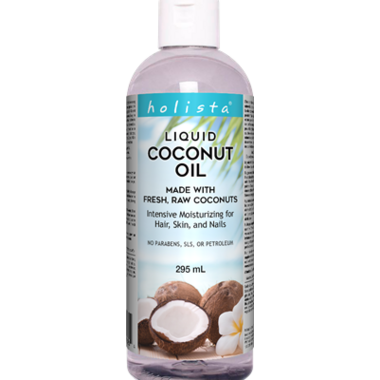 Isn't too greasy, doesn't reek of coconut and is just perfect for moisturizing in the shower (don't slip!). I also use it right after I come out of the shower on my feet, and slip on some cotton socks. This is perfect for my essential oil recipes. Am very pleased with this product. I love the option of the liquid, especially for cosmetic use. I use it as a facial cleanser and moisturiser. Mixed with baking soda it makes a good exfoliator once or twice a week. It is also good value for the price as a little goes a long way.I highly recommend.